Berta Cáceres, a Lenca indigenous leader and coordinator of the Civic Council of Popular and Indigenous Organizations of Honduras (COPINH) fighting against the Agua Zarca Dam in western Honduras was murdered on March 3rd. 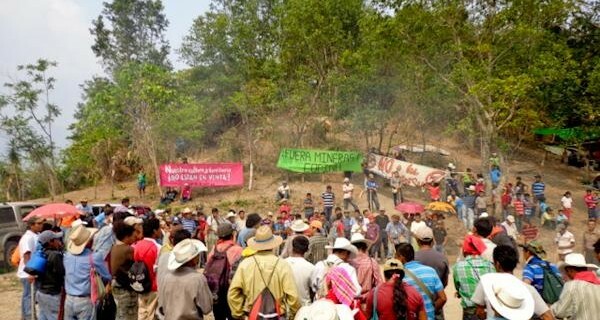 Nelson García, a COPINH member and fellow opponent of the Agua Zarca project, was killed on March 15th. Walter Méndez, president of the La Lucha Cooperative and member of the Petenero Front Against Dams of Guatemala was assassinated on March 16th. Guatemalan Mario Salazar, director of Radio Estéreo Azúcar in Asunción Mita who reported on the struggles of the Petenero Front, was killed on March 19th. These acts of terror took place in different countries, against different indigenous leaders, hundreds of miles away from each other—but they are deeply, and criminally, related. While these indigenous leaders were being murdered, a group of Guatemalan marines concluded a six-week training in the US military base in Honduras where the US’s Bravo Joint Task Force is located. The training strengthened their ability to operate with light equipment in urban settings, such as the towns in Honduras and Guatemala where assassinations are taking place against citizens who peacefully defend their way of life. In Honduras, Berta and Nelson struggled against the Agua Zarca Dam because it will destroy their territory and threatens the livelihoods of future generations. Walter Méndez was killed because he opposed the sale of land belonging to La Lucha Cooperative to industrial palm oil producers. The sale will destroy Coop. Walter and Mario were committed citizens defending their lives and their rights under Guatemalan law. These assassinations are no coincidence. They respond to the financial greed of northern corporations, determined to extract natural resources from rural indigenous communities that they both exploit and despise. They are not the product of everyday violence, as the exploiters and their allies claim. No, this is political violence against organized peoples peacefully defending their land. This violence responds to the Northern countries’ plans to exploit resources for profit, regardless of the destruction it means for people and the environment. The assassinations seek to instill fear and terror in these communities to keep them from organizing against theft and injustice. This violence responds to the Northern countries’ plans to exploit resources for profit, regardless of the destruction it means for people and the environment. The violence and the assassinations pave the way for corporate access to natural resources. Rural and indigenous peoples are simply obstacles to be removed. The assassins are the instruments of empire, trained to eliminate opposition by any means. The communities are different, but the motives behind the assassinations are the same—in both Honduras and Guatemala.